Have you ever seen a black bear in your backyard and thought it was searching for an easy meal? Black bears are opportunistic foragers when natural food sources are isolated, but bears do prefer their natural habitat of forests over your yard. Therefore, researchers in Florida suggest that black bear management should focus on conserving microhabitats – small, specialized habitats within a larger habitat. Image credits: U.S. Fish and Wildlife Service Headquarters, 2012. The American black bear (Ursus americanus) is the most widely distributed bear species, ranging across three countries (IUCN Red List, 2018). Black bears play a key role in maintaining a healthy ecosystem. Their foraging habits increase seed dispersal, aid in the process of decay, and redistribute nutrients. Their feces spread seeds to germinate, which promotes pollination and facilitates plant reproduction, further increasing biodiversity. While foraging for insects, bears accelerate the decomposition of the logs they overturn, returning key nutrients to the soil. Healthy soil even benefits human health. Soil with diverse biota enhances the quality and quantity of plant production, increases water retention (reducing flooding and runoff), and reduces human illness caused by particles of dust or pathogens (Carey, 2016). 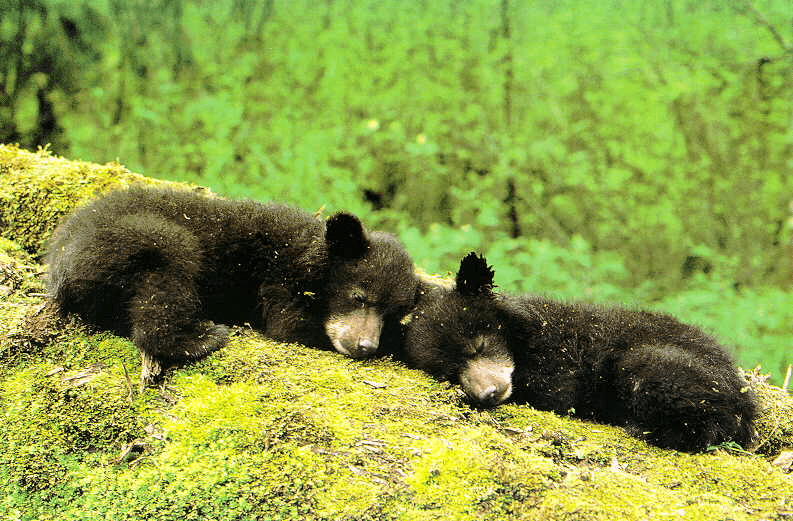 Thus, black bears provide benefits for all cohabiting species – including us. As human development expands, bears experience habitat loss and fragmentation. Unfortunately, this has led to an increase in human-bear conflicts. Conflicts result in property damage, economic loss, human injury, bear euthanasia, translocation and hazing (rubber bullets, bean bag shotgun rounds, light/sound “scare tactics”), according to the Telluride Daily Planet. For large mammals in fragmented areas, researchers in Florida found that it’s crucial to understand the microhabitat needs that influence habitat use. This can help wildlife agencies to identify limiting resources, and develop better habitat management strategies. Despite the misconception that bears prefer human food, it’s been shown that bears choose their natural diet of native plants when available. The study, published in Global Ecology and Conservation, further emphasizes black bears’ preferences for the au naturale. The study investigated “microhabitat features of areas within home ranges that received high vs. low intensity of use”. This was based on utilization distribution. The features of high-use microhabitats included “high canopy cover, high visual obstruction, high cover of food-producing shrubs, and closer to the creeks but farther away from the roads”. The high-use sites were utilized for resting and foraging, and associated in forested wetlands where cover and food was most abundant. Cover is important “to reduce disturbance from other bears or humans and possibly to aid in thermoregulation”. Low-use sites, where bears were seen less frequently, were used primarily for travelling long distances between preferred areas. As bears’ natural habitat continues to become fragmented, conservation efforts should focus on restoring “structural and compositional aspects” of their microhabitats. As an umbrella species – whose conservation results in many other species being conserved – black bears should be valued and their forests should be micromanaged, if you will. To help maintain their natural habitat you can secure your trash, bird feeders, pet food, and other bear attractants. Your actions, combined with proper land and wildlife management, will ensure the survival of black bears. The main findings appeared in the journal Global Ecology and Conservation. This is a guest post by Nicole Bodzewski, a graduate student with Miami University, based in Denver, CO.